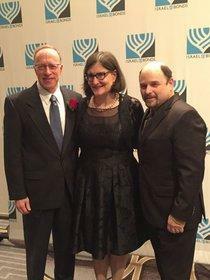 NEW YORK, NY--(Marketwired - Feb 14, 2017) - Israel Bonds recently congratulated Mr. Elie Hirschfeld and his wife Sarah, and honored them with the Israel69 Award for their long-standing dedication to Israel and the Jewish community. They were among 15 recipients from the United States, Canada and Mexico presented with awards for their commitment and significant contributions to the important work supported by Israel Bonds. "I am humbled and honored to receive the Israel69 Award from Israel Bonds. Their mission is an important one that Sarah and I could not be more proud to support," said Elie Hirschfeld. Individuals recognized with this prestigious award were celebrated at a cocktail reception and the Prime Ministers Club Dinner hosted by Mr. Jason Alexander, and held at the Fontainebleau Miami Beach, on February 12, 2017. Mr. Elie Hirschfeld is President of Hirschfeld Properties. He is a successful real estate developer, philanthropist and community leader based in New York City. This award recognizes Sarah and Elie Hirschfeld for their ongoing achievements and dedication to Israel Bonds. For Israel, having the support of Israel Bonds -- a reliable and independent financial pipeline -- is an invaluable and strategic national resource, especially since Bonds clients have proven time and again that when Israel is in the midst of a crisis, they do not walk away. Dignitaries and an audience of leaders dedicated to strengthening relations with Israel attended the event to applaud the accomplishments of Sarah and Elie Hirschfeld and other award recipients. Elie Hirschfeld serves as President of Hirschfeld Properties, LLC, a leading New York-based real estate development firm. Under the leadership of Elie Hirschfeld, Hirschfeld Properties has engaged in the development or ownership of some of the most renowned office buildings, hotels, multi-family residential buildings, parking facilities and retail projects in New York City. It has developed projects such as luxury residential towers Park Avenue Plaza, The Gotham and The Exchange, Crowne Plaza Hotel, Hotel Pennsylvania, New York's first open-air parking garages, Manhattan Mall and the Sports Club LA Building.